Oh the drama! In this funny toddler t-shirt your little fashionista will save the dramas about the day’s fashion for another day! Premium black cotton to keep your toddler cool & comfy all day. Funny white showtime styled slogan, guaranteed not to fade. Slogan reads ‘THE TANTRUM, A TODDLER PRODUCTION. Choose from UK or worldwide delivery options. Perfect for toddler boys or girls. Toddler sizes 1-2 years, 2-3 years & 3-4 years. A great kids gift for a little drama fan or film fanatical parents, give them a giggle! As quick as a flash, slip these extraordinary funky baby trousers on your trendy tot & you’ll have the coolest kid at the park by far in an instant! Lusciously soft black funky baby & toddler trousers. Easy care & soft loop back cotton. 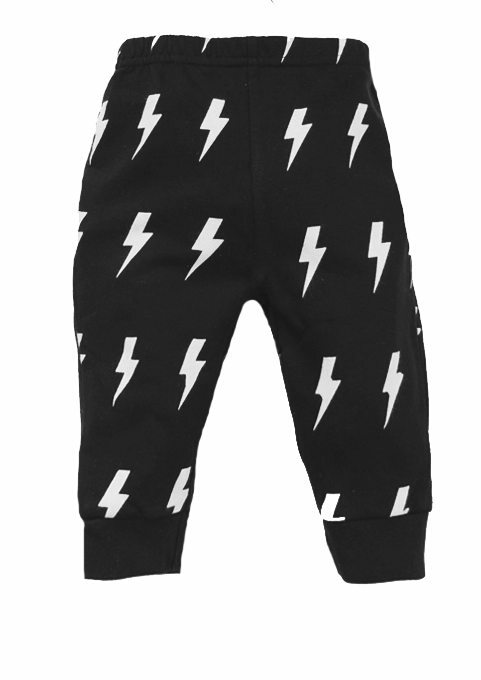 Super funky trendy little lightning bolts all over. Elasticated waist to these cute kids trousers makes nappy changes & potty trips quick. The cuffs to ankles keep them out of those muddy puddles. A perfect & subtle addition to any budding David Bowie fan’s clothing collection. Take your pick from UK & international delivery options. Sizes 3-6 months, 6-12 months, 1-2 years, 2-3 years. 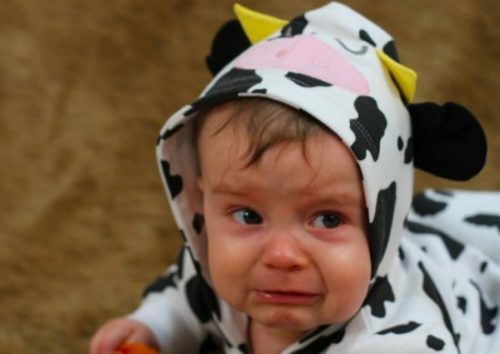 Our top pick of toddler tantrum reasons shared with us by our Facebook fans…. 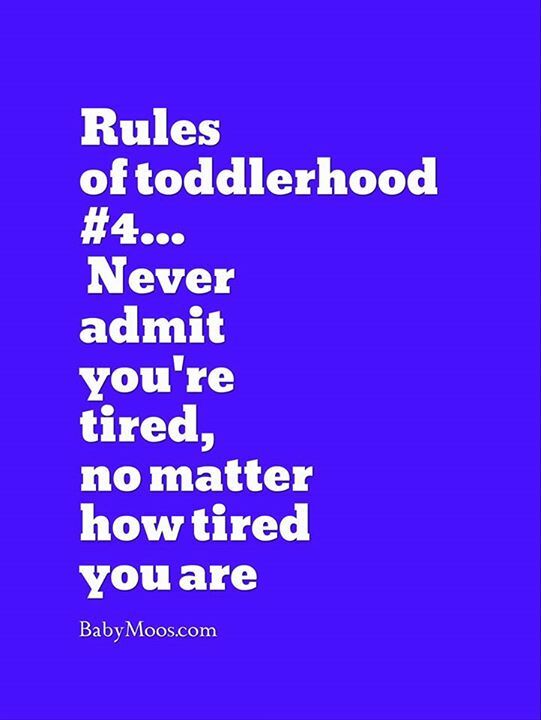 We’d love to hear about any funny toddler tantrums you’ve endured, let us know in the comments section! 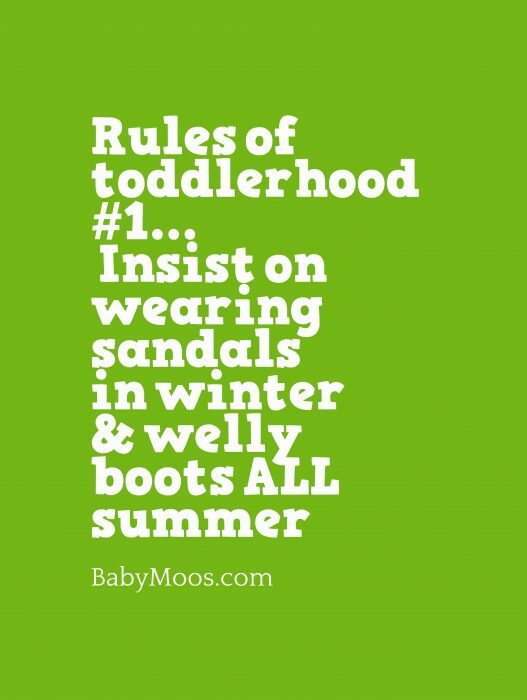 Insist on wearing sandals all winter & welly boots ALL summer! That sandwich that they’ve been oh so very hungry for all morning, well they might’ve liked their sandwich cut in triangles at the weekend, but that was then, how very dare you cut them in triangles today! cut the sandwich in squares? well that is wrong too! Need a wee, think you might get 30 seconds peace? 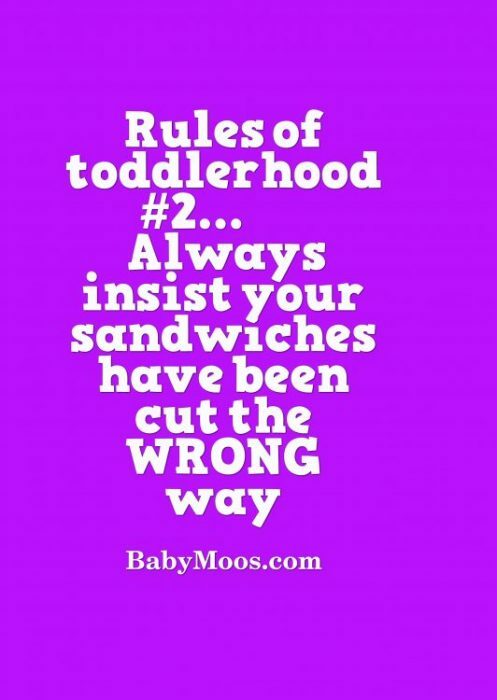 think again… that cute toddler face will appear at the door any second! How things change no doubt in another 12 years they’ll be refusing to get out of bed & we bet you now a adult would jump at the chance of a nap now, wouldn’t you? 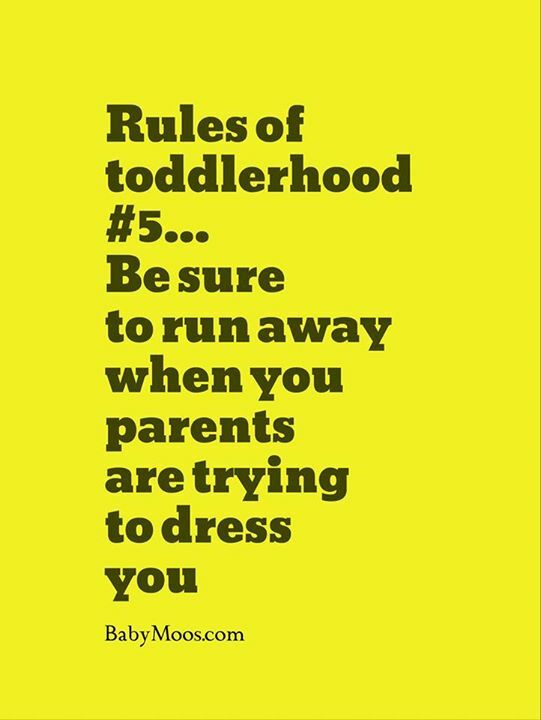 As a toddler once you’re steady on your feet, we understand this is a great past-time, usually done naked & at super fast speeds particularly if you hear mum or dad say you’re going to be late, what’s that, a t-shirt? GO, RUN! 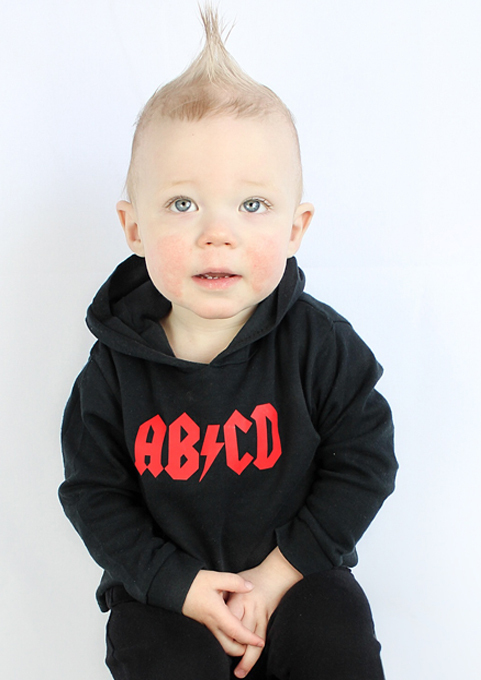 This rock kids clothes hoodie is for the cool kids that have earned their rock star status after many nights of rockin’ all night, but when they crawl into nursery donning this, everyone will see they know a thing or two about pulling off pure cool too. Soft lightweight black cotton hooded baby & toddler top. Cool & vibrant red AB/CD rock band inspired print to chest. Perfect for layering up or down. Makes a perfect 1st birthday or rock baby gift for adding to your rock kids clothes collection. UK & worldwide delivery options. Baby, toddler & kids sizes 3-6 months, 6-12 months, 1-2 years, 2-3 years, 3-4 years & 4-5 years. Superhero new baby gift set for the baby that likes to save their parents from sleep night after night! whether you’re after a new baby shower gift or a little present for your own little hero this gift set is sure to save the day! 1 x Heroic flash baby sleepsuit outfit in any size you choose. 2 x These Fools… award winning baby bibs. 3 x Exclusive Baby Moo’s stickers. We’ll lovingly bundle it together in a free organza gift bag with stickers & a blank reverse tag for you to write your message, ready to give to the lucky new parents! Baby Moo’s superhero & baby grows are made in the UK ensuring supreme quality. Our funny baby bibs are made with super soft cottons & polyester fleece backs to keep little chests clean & dry. The fun baby bibs are AWARD WINNING & designed to see baby through to the toddler years to suits up to 3 years. UK & international delivery available. A perfectly cool alternative to a baby shower gift basket or hamper for superhero fanatic baby boys & girls. 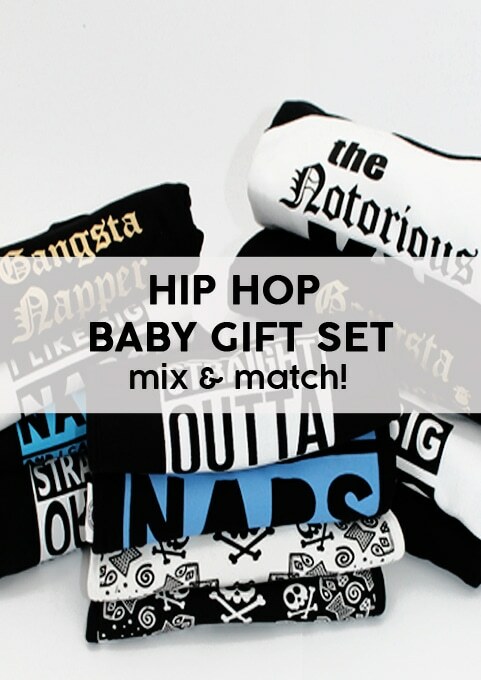 Create your own hip hop trendy baby gift set, choose from a minimum of 2 of our hip hoppin’ baby grows, sleepsuits or tops & bibs to make your own gift set & give them a baby shower gift sicker than your average. Choose a minimum of 2 of our of our hip hop baby clothes or bibs & we’ll lovingly bundle it together in a free organza gift bag with stickers & a blank tag to write your message, ready to give to the lucky new parents… it’s all good baby, baby. Our urban hip hop baby clothes are made in the UK ensuring top quality. Our trendy baby bibs are made with super soft cottons & polyester fleece backs to keep little chests clean & dry. Choose from rap & hip hop baby grows, sleepsuits, tops & t-shirts, sizes 0-4 years. Our hip hop baby bibs are designed to see baby through to the toddler years to suits up to 3 years. A perfect alternative to a baby shower gift basket for rap lovin’ & new baby boys & girls. 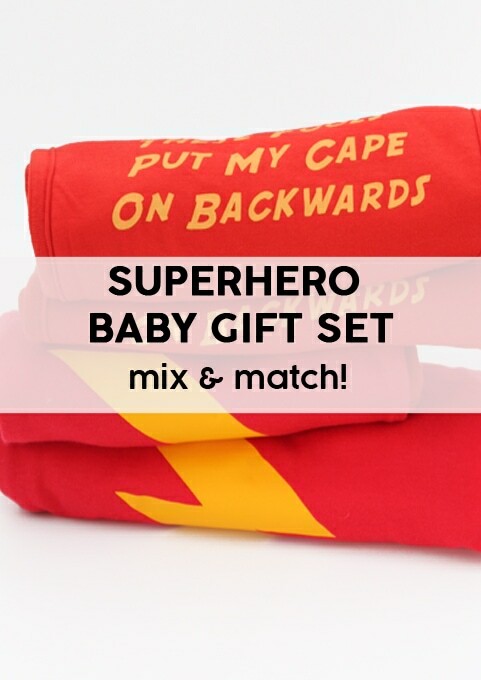 Create your own superhero baby gift set, choose from a minimum of 2 of our funky superhero baby grows, sleepsuits or bibs to make your own gift set & give them a new baby gift that’ll instantly save the baby shower from bland! Choose a minimum of 2 of our of our superhero baby items & we’ll lovingly bundle it together in a free organza gift bag with stickers & a blank tag to write your message, ready to give to the lucky new parents! 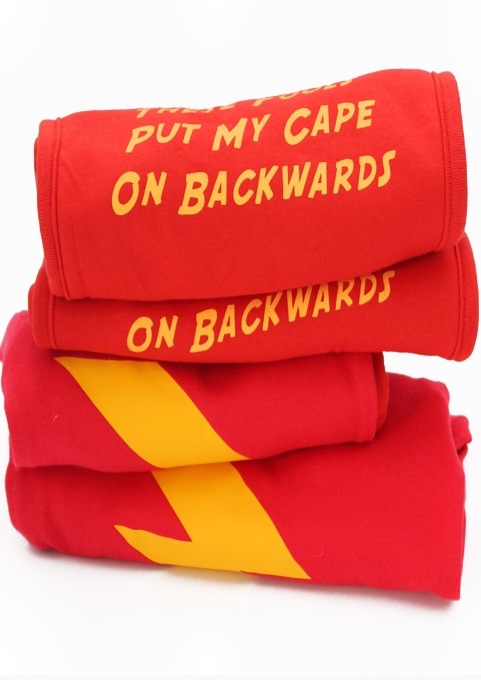 Our superhero baby clothes are made in the UK ensuring heroic quality. Choose from superhero baby grows or sleepsuits sizes 0-18 months. Our fun award winning baby bibs are designed to see baby through to the toddler years to suits up to 3 years. A perfectly heroic alternative to a baby shower gift basket or hamper for superhero new baby boys & girls. 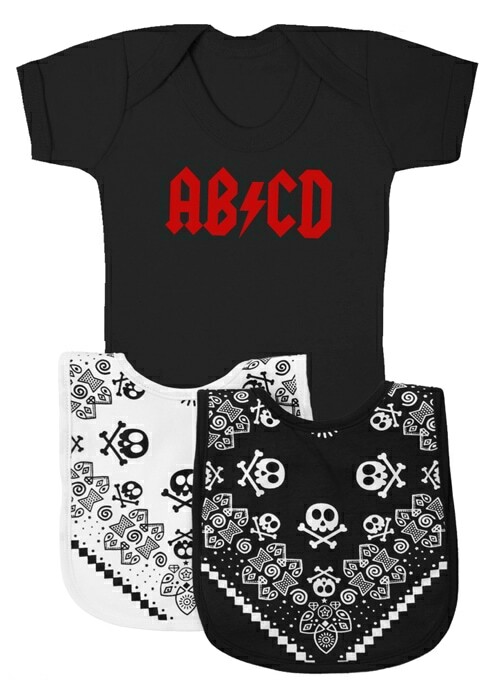 Rock music funny baby gift set for the new baby that was born to rock all night! Whether you’re after a funny baby shower gift or a little baby present for your own little rock star this gift set is to leave you wanting to break out that air guitar! 1 x AB/CD baby grow in any size you choose. 1 x Cool black rock star bib. 1 x Stylish white rock star baby bib. We’ll lovingly bundle it together in a free organza gift bag with stickers & a blank tag for you to write your message, ready to give to the lucky new parents! Baby Moo’s rock music baby grows are made in the UK ensuring supreme quality. Our stylish & fun baby bibs are made with super soft cottons & polyester fleece backs to keep little chests clean & dry. The trendy baby bibs are AWARD WINNING & designed to see baby through to the toddler years to suits up to 3 years. A perfectly cool alternative to a baby shower gift basket or hamper for music lovin’ & new baby boys & girls. 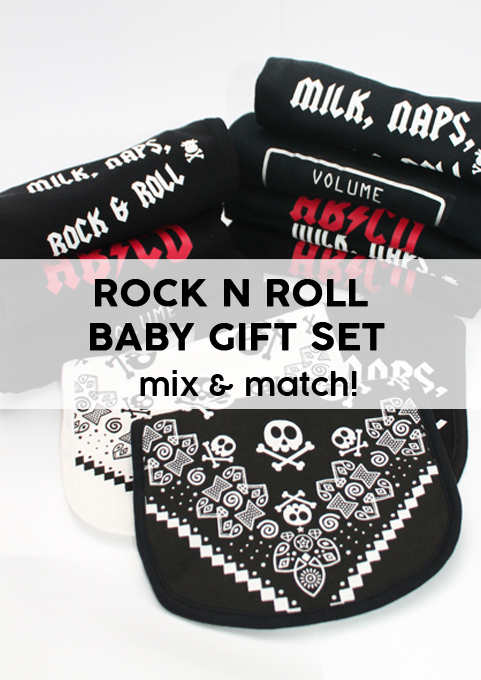 Create your own rock n roll baby gift set, choose from a minimum of 2 of our fun rockin’ baby grows, sleepsuits or tops & bibs to make your own gift set & give them the coolest baby shower gift by far! Choose a minimum of 2 of our of our rock n roll baby items & we’ll lovingly bundle it together in a free organza gift bag with stickers & a blank tag to write your message, ready to give to the lucky new parents! 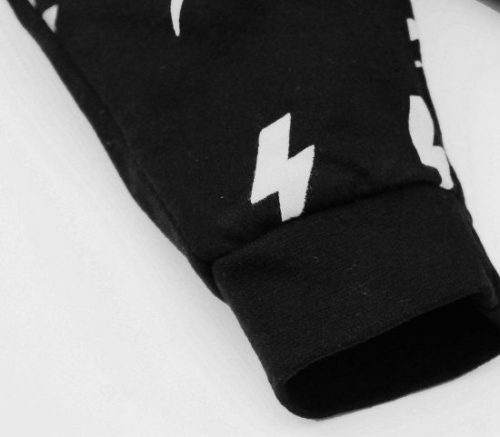 Our rock n roll baby clothes are made in the UK ensuring supreme quality. Our trendy & fun baby bibs are made with super soft cottons & polyester fleece backs to keep little chests clean & dry. Choose from rock star baby grows, sleepsuits, hooded tops & t-shirts, sizes 0-4 years. Our quirky baby bibs are designed to see baby through to the toddler years to suits up to 3 years.